ADA MALL, a new shopping center under construction in Belgrade, Serbia, will welcome its first visitors at the end of May. The project is a 105 million EUR investment that is expected to introduce innovation to the Serbian market due to its unique design and tenant mix. 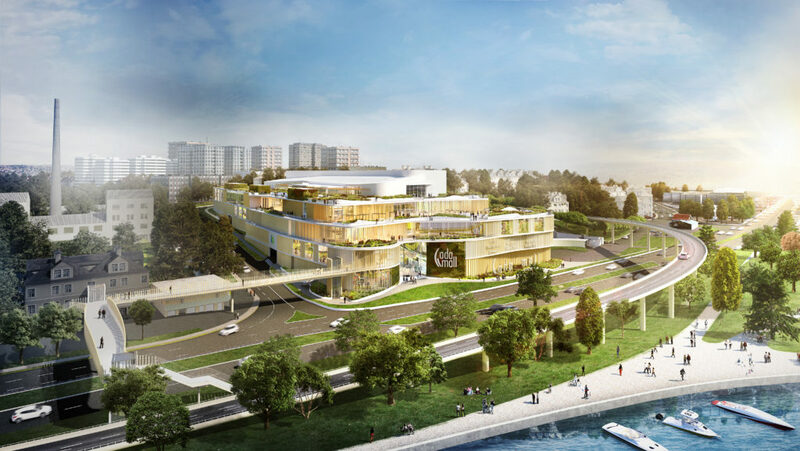 ADA MALL, developed by GTC, is the next generation shopping center located on Radnička Street in Belgrade, opposite from the popular recreational zone Ada Ciganlija. The complex will stand out from other shopping centers in Serbia mainly due to its design, as well as the fact that it is built according to the latest green building standards. ADA MALL is designed to reflect the shape of a lake, boasting a glass and plaster facade covered with vertical wooden elements, green walls, terraces and gardens. With a gross leasable area of 34,000 sqm on five levels, it will provide a one-of-a-kind shopping experience, introducing new international brands to Serbia. In addition to retail stores, the shopping center will also offer multi-purpose entertainment facilities, bars, restaurants and three floors of underground parking with approximately 1,000 parking spaces. ADA MALL will push the envelope for retail and entertainment, introducing innovations such as Merkada - a concept that offers a multicultural experience with many different food and drink options under one roof. The mall will also house the first Kiehl’s cosmetics stores in Serbia, as well as the first CineStar cinema in Belgrade. Other future tenants include CCC, Under Armour, H&M, Sinsay, Reserved, Carpisa, BUZZ, Calliope, dm drogerie markt, Diopta, Galileo and Fashion&Friends. View the full tenant mix of ADA MALL on their official website. To connect with a representative of ADA MALL, click HERE.